The United States dollar (sign: $; code: USD; also abbreviated US$), also referred to as the American dollar, is the official currency of the United States of America and its overseas territories. It is divided into 100 smaller units called cents or pennies. The U.S. dollar is the currency most used in international transactions and is one of the world's dominant reserve currencies.Several countries use it as their official currency and, in many others, it is the de facto currency. It is also used as the sole currency in some British Overseas Territories (British Virgin Islands and Turks and Caicos ). The first dollar coins issued by the United States Mint (founded 1792) were similar in size and composition to the Spanish dollar. The Spanish, U.S. silver dollars, and Mexican silver pesos circulated side by side in the United States, and the Spanish dollar and Mexican peso remained legal tender until 1857. The coinage of various English colonies also circulated. The lion dollar was popular in the Dutch New Netherland Colony (New York), but the lion dollar also circulated throughout the English colonies during the 17th century and early 18th century. Examples circulating in the colonies were usually worn so that the design was not fully distinguishable, thus they were sometimes referred to as "dog dollars". The U.S. dollar was created by the Constitution and defined by the Coinage Act of 1792. It specified a "dollar" to be based in the Mexican peso at 1 dollar per peso and between 371 and 416 grains (27.0 g) of silver (depending on purity) and an "eagle" to be between 247 and 270 grains (17 g) of gold (again depending on purity). The choice of the value 371 grains arose from Alexander Hamilton's decision to base the new American unit on the average weight of a selection of worn Spanish dollars (and later Mexican peso). Hamilton got the treasury to weigh a sample of Spanish dollars and the average weight came out to be 371 grains. A new Spanish dollar was usually about 377 grains in weight, and so the new U.S. dollar was at a slight discount in relation to the Spanish dollar. Coinage Act of 1792 set the value of an eagle at 10 dollars, and the dollar at 1/10 eagle. It called for 90% silver alloy coins in denominations of 1, 1/2, 1/4, 1/10, and 1/20 dollars; it called for 90% gold alloy coins in denominations of 1, 1/2, 1/4, and 1/10 eagles. 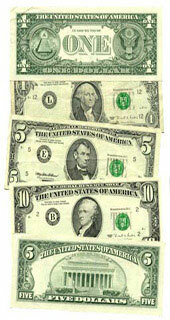 The early currency of the USA did not exhibit faces of presidents, as is the custom now. In fact, George Washington was against having his face on the currency, a practice he compared to the policies of European monarchs. The currency as we know it today did not get the faces they currently have until after the early 20th century; before that "heads" side of coinage used profile faces and striding, seated, and standing figures from Greek and Roman mythology and composite native Americans. The last coins to be converted to profiles of historic Americans were the dime (1946) and the Dollar (1971). The symbol $, usually written before the numerical amount, is used for the U.S. dollar (as well as for many other currencies). The sign was the result of a late 18th-century evolution of the scribal abbreviation "ps" for the peso. The p and the s eventually came to be written over each other giving rise to $. Another popular explanation is that it comes from the Pillars of Hercules on the Spanish Coat of arms on the Spanish dollars that were minted in the New World mints in Mexico City, Potosi, Bolivia, and in Lima, Peru. These Pillars of Hercules on the silver Spanish dollar coins take the form of two vertical bars (||) and a swinging cloth band in the shape of an "S". Yet another fictional explanation suggests that the dollar sign was formed from the capital letters U and S written or printed one on top of the other. This theory, popularized by novelist Ayn Rand in Atlas Shrugged, does not consider the fact that the symbol was already in use before the formation of the United States. Today, USD notes are made from cotton fiber paper, unlike most common paper, which is made of wood fiber. U.S. coins are produced by the United States Mint. U.S. dollar banknotes are printed by the Bureau of Engraving and Printing and, since 1914, have been issued by the Federal Reserve. The "large-sized notes" issued before 1928 measured 7.42 inches (188 mm) by 3.125 inches (79.4 mm); small-sized notes, introduced that year, measure 6.14 inches (156 mm) by 2.61 inches (66 mm) by 0.0043 inches (0.11 mm). When the current, smaller sized U.S. currency was introduced it was referred to as Philippine-sized currency because the Philippines had previously adopted the same size for its legal currency. Currently, the US government maintains over 800 billion US dollars in cash money (primarily Federal Reserve Notes) in circulation.The amount of cash in circulation is increased (or decreased) by the actions of the Federal Reserve System. Eight times a year, the 12-person Federal Open Market Committee meet to determine US monetary policy. Every business day, the Federal Reserve System engages in Open market operations to carry out that monetary policy. If the Federal Reserve desires to increase the money supply, it will buy securities (such as US Treasury Bonds) anonymously from banks in exchange for dollars. Conversely, it will sell securities to the banks in exchange for dollars, to take dollars out of circulation. When the Federal Reserve makes a purchase, it credits the seller's reserve account (with the Federal Reserve). This money is not transferred from any existing fundsit is at this point that the Federal Reserve has created new high-powered money. Commercial banks can freely withdraw in cash any excess reserves from their reserve account at the Federal Reserve. To fulfill those requests, the Federal Reserve places an order for printed money from the US Treasury Department. The Treasury Department in turn sends these requests to the Bureau of Engraving and Printing (to print new dollar bills) and the Bureau of the Mint (to stamp the coins). Usually, the short term goal of open market operations is to achieve a specific short term interest rate target. In other instances, monetary policy might instead entail the targeting of a specific exchange rate relative to some foreign currency or else relative to gold. For example, in the case of the USA the Federal Reserve targets the federal funds rate, the rate at which member banks lend to one another overnight. The other primary means of conducting monetary policy include: (i) Discount window lending (as lender of last resort); (ii) Fractional deposit lending (changes in the reserve requirement); (iii) Moral suasion (cajoling certain market players to achieve specified outcomes); (iv) "Open mouth operations" (talking monetary policy with the market).